Prototype: German Federal Railroad (DB) class E 50 heavy freight locomotive. The largest class of the standard design electric locomotives from the new construction program of the Fifties. The locomotive looks as it did when first built with double headlights and rain gutters. Model: Era III. The locomotive has a die-cast metal frame and body. It also has a 21-pin digital connector. 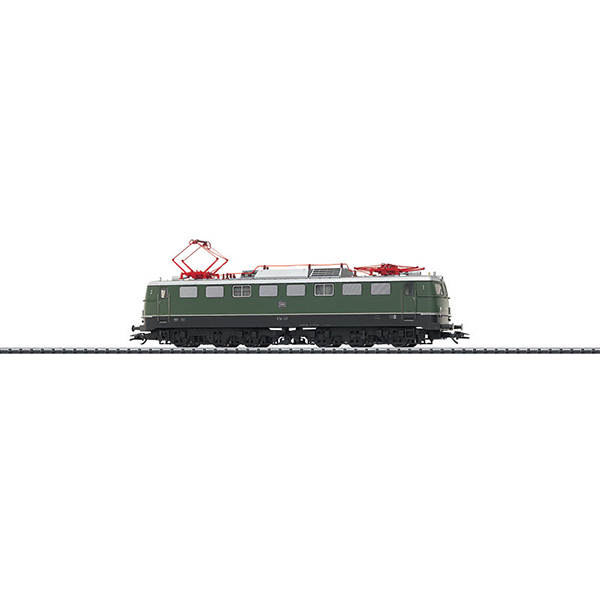 The locomotive has a can motor with a bell-shaped armature and a flywheel, centrally mounted. 4 axles powered by means of cardan shafts. The headlights are maintenance-free, warm white LEDs and the maker lights are red maintenance-free LEDs. The headlights and marker lights will work in conventional operation and can be controlled digitally. The locomotive has separately applied metal grab irons. The engineer's cabs and engine room have interior details in relief. The locomotive has NEM coupler pockets. Length over the buffers 224 mm / 8-13/16.